If I could give a 6 star rating, I would! We thought it was wonderful. Very clean, great location. We travel to Port Douglas yearly with our son and parents and this year decided to stay at Coconut Grove!! Wow!! From the moment we arrived, we were greeted warmly by all the staff and this certainly made a wonderful first impression. We stayed in a balcony 3 BR apartment and although we didn't have our own pool, it certainly had all the amenities we required. The apartment was modern, extremely clean and roomy. The bathrooms were stocked with L'Occitane products and there was a cheese platter on arrival in our fridge which was an impressive surprise. The kitchen and barbeque were fully stocked with any utensil needed and when we didn't eat out, we enjoyed eating, having a drink or a coffee (from our coffee pod machine) on our balcony. The property is situated on Macrossan st and a convenient walk to the shops, restaurants and beach. Although it is on the main street, noise was never an issue and it was peaceful, especially in the evenings. Cannot recommend it enough! We will certainly be returning. Absolutely fantastic, thoroughly enjoyed every minute of our stay here. The hotel is in the perfect location... just meters from 4 mile beach, on the main street only a few minutes walk to all restaurants and shops and just far enough out to still be peaceful and quiet. The apartment itself was fantastic, clean, spacious and modern. Had everything we could possibly need and plenty of space to spread out and enjoy ourselves. The pool, balcony, outdoor area was huge and a fantastic space to enjoy the sunshine and great weather. Everything was modern, of high quality and was well cared for and clean. The hotel itself was great, with plants and water features and plenty of places to relax and enjoy the serenity. Will definitely be back, this is one of my favourite hotels in Port Douglas and I can’t wait to return. From reading other reviews we decided to book at Coconut Grove. We booked on level 3 which has a private rooftop pool/spa with each apartment. Checking in we were given a friendly welcome and shown the access options. The apartment was stunning. Fresh and modern design, superbly furnished and appointed with everything you would expect with a 5 star rating. Located a short, easy walk to shops, restaurants and the beach. As a special touch, the staff gave us a small gift after being stuck in Cairns overnight due to a temporary road closure. All staff we came across were friendly and helpful. 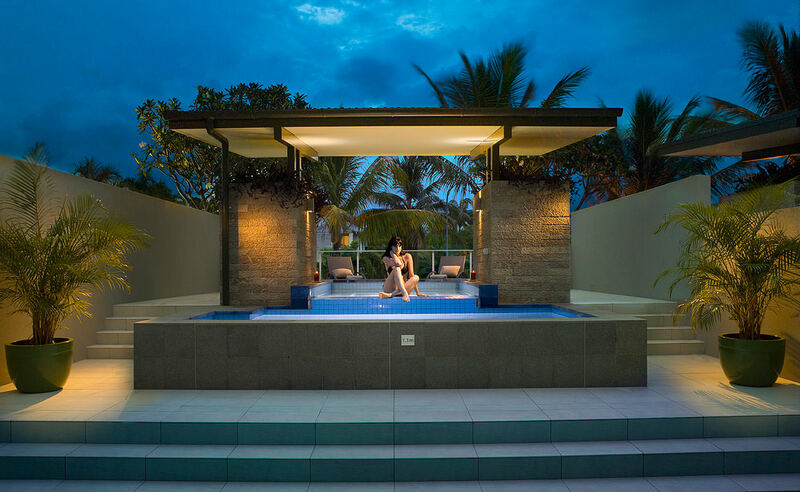 While it's priced at the upper end of Port Douglas accommodations it's worth it and we would have no hesitation recommending Coconut Grove and hope to return again. The size and style of these rooms is incredible. Just pure elegance. My partner used one of these apartments to get ready for our wedding. With herself and 4 others getting their hair and make up done, there was plenty of room, plenty of amenities and plenty of wonderful photo opportunities. If you're looking for a place to get ready on your own wedding day, we highly recommend this one. If we had to do it all over, the only thing we would change. Would be a longer stay at Coconut Grove. This place was perfect. My partner got ready for our wedding here and we could not be happier with the accommodation. Plenty of room for hair dressers, make up artists & champagne. Thank you for having us, we will be back. I have been lucky enough to stay = here twice now and on both occasions have been highly impressed. The spaces, decor and cleanliness is exceptional. Staff are always welcoming and helpful. The rooms with private pools are heaven. Kitchens are well equiped. Beds are very comfy and the linen is lovely. Loccitane soaps and bath bombs - perfect. We stayed over the Australia Day long weekend. This is now our go to place to stay when up in FNQ. We stayed in the Penthouse (1brm - the other 2 rooms are simply locked). The property is maintained to the highest standard and the service is excellent. 2Fish downstairs is an absolute bonus. We have stayed here the last 4 times when visiting Port Douglas and it has never disappointed. And we will be staying there again next time we visit.